A police dog detained a suspected drug dealer in Brighton last night (Tuesday 19 February). 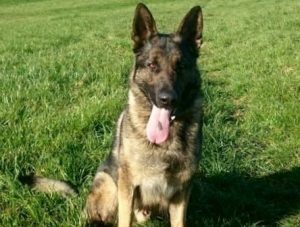 Sussex Police said: “A suspected drug-dealer said ‘it really hurt’ when he was bitten and detained by Police Dog Spike. “This was after he twice attempted to outrun officers following an incident in Brighton late on Tuesday evening (19 February). “About 10.20pm that night, PC Mark Tully was on route to walk his canine counterpart at East Brighton Park, when he noticed a silver Volkswagen Polo in the car park which smelled strongly of cannabis. “The vehicle made off from the scene and was pursued into nearby Rugby Place, where the suspect got out and ran. “PD Spike was commanded to pursue the man and took him to the floor. “However, as PC Tully controlled the dog and called for assistance, the man ran off again. “PD Spike quickly caught up and bit his arm in order to detain him for a second time, at which point the suspect pleaded for him to let go. “Due to his previous behaviour, both PC Tully and PD Spike kept a hold of the man until further units arrived to arrest him. “The 23-year-old, from Leeds, was arrested on suspicion of possession with intent to supply cannabis, failing to stop when required by a police officer, dangerous driving and resisting a police officer in the execution of their duty.